THE UHURUVERSE is releasing a solo album JANUARY 1, 2018! 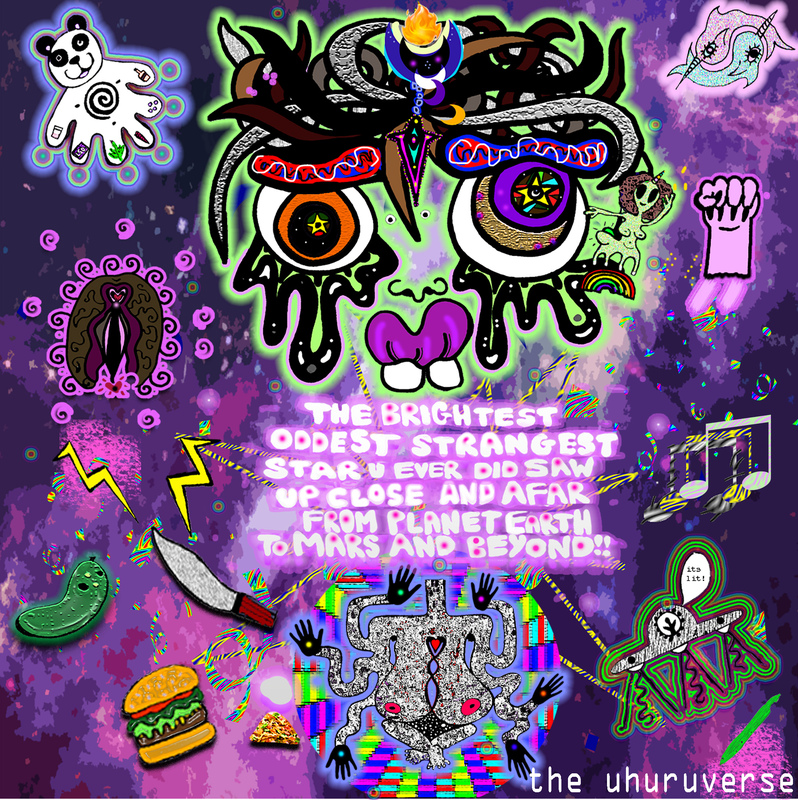 “The Brightest Oddest Strangest Star U Ever Did Saw Up Close And Afar From Planet Earth To Mars And Beyond!” is produced by NVSBL GVNG and features Jupiter Black, sondriaWRITES and more! With the illy album art work by SHA GAZE the great and mighty color slanger! You can pre-order the album RIGHT NOW by e-mailing hashtagsnatchpower@gmail.com and listen TODAY! PLUS! You can pull up to the listening party: NO EARTHLINGS ALLOWED, to be held at Human Resources LA (410 Cottage Home Los Angeles, CA) on DECEMBER 24TH. The listening party will feature performances by the artist, Tolliver, NVSBL GVNG plus art installations by Missinglewood and Glampchop…there’s a cash bar and a 420 bar…and it’s a joint release party for sondriaWRITES’ “Unthinkable Acts”! This entry was posted in music and tagged blackgirlmagic, blackwomen, blaqt, debut, femme, funk, hiphop, jupiterblack, music, nvsblgvng, punk, queer, rap, shagaze, snatchpower, sondriawrites, thebrightestoddeststrangeststarueverdidsawupcloseandafarfromplanetearthtomarsandbeyond, theuhuruverse. Bookmark the permalink.